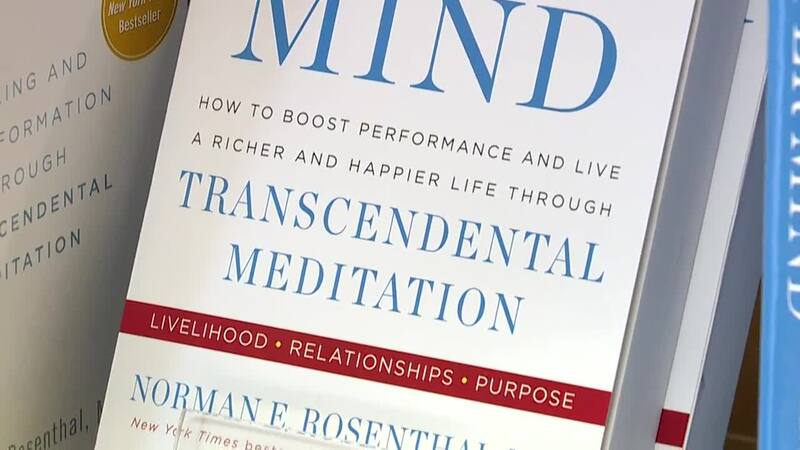 Dozens of celebrities have touted the benefits of transcendental meditation…from Katy Perry to Paul McCartney, Nicole Kidman to Hugh Jackman, and even billionaires Rupert Murdoch and Oprah Winfrey. Regular folks here in southeast Michigan are among TM’s fans, too. “It's kind of like taking a little vacation every day. You don't need to get away if you practice TM,” said Chris Forte – a self-described yogi, businessman, and author from Troy. “It really has just restored a sense of peace and sort of joyfulness throughout the day,” explained Lisa Nardone – a Mom of three who recently retired from the advertising business after 27 years. But what is Transcendental Meditation -- or TM? Do you sit in a darkened room on a pillow with your legs crossed, resting your hands on your knees while chanting “Om” softly? "No. That's the beauty about TM is that it's user friendly,” explained James Cahaney -- the Regional Director of the Transcendental Meditation center in metro Detroit. "First, we'll just sit comfortably, and let's just close our eyes," Cahaney instructed students during an example meditation session a few minutes prior. Cahaney teaches the technique with his wife Linda Simmons. Students are instructed in 60-to-90-minute sessions over four days by certified TM teachers. "It's a very systematic approach that allows a person to very quickly settle their mind down to a very profound level of quiet, silence." The goal is to practice TM for 15-to-20 minutes twice a day. That’s what busy mom Lisa Nardone does. "The great thing about TM is that you can do it anywhere. I do it at the park, sometimes I'll do it at the car when I'm waiting for the kids to get done with their activities, I do it at the airport, on a plane,” said Nardone. Macomb County family practitioner Dr. Steven Thiboult learned TM when he was in 10th grade at the suggestion of his uncle – a professor. "I couldn't read for more than 5 minutes at a time or study [or] just focus. I couldn't get to it. The minute I learned that technique, I could study for an hour straight,” THiboult recalled. “Next thing I know, I was getting all As." And he’s never stopped meditating. “A few hours you learn it, and then you can use it the rest of your life. That’s been the big thing that’s hit me,” Dr. Thiboult added. For some it’s become a family affair. Peter Shillingford of Farmington learned TM, and he liked it so much that he convinced many of his family members to learn the practice. "I wanted them to get out of it what I got out of it which was less stress, less tension, and better decision making and better relationships,” said Shillingford. Urologist Tarek Pacha started learning TM several weeks ago, and he already believes it can help some of his patients. "Interestingly enough stress is one of the leading causes of erectile dysfunction in our younger men,” explained Dr. Pacha. More than 400 studies on the benefits of TM have been published in peer-reviewed scientific and medical journals…pointing to the reduction of heart disease, hypertension, and stroke. Recent studies are even showing great promise in the treatment of PTSD. James Cahaney learned the technique when he was a college student at Kent State in 1970 following the Kent State shootings. He was so impressed by how TM improved his life, he began teaching the practice three years later. He’s been a certified instructor for 43 years. The course costs several hundred dollars, but discounts are offered for those needing financial assistance. You can find out more information on the Transcendental Meditation website here.